Do you love discovering ways to work smarter? Me too. 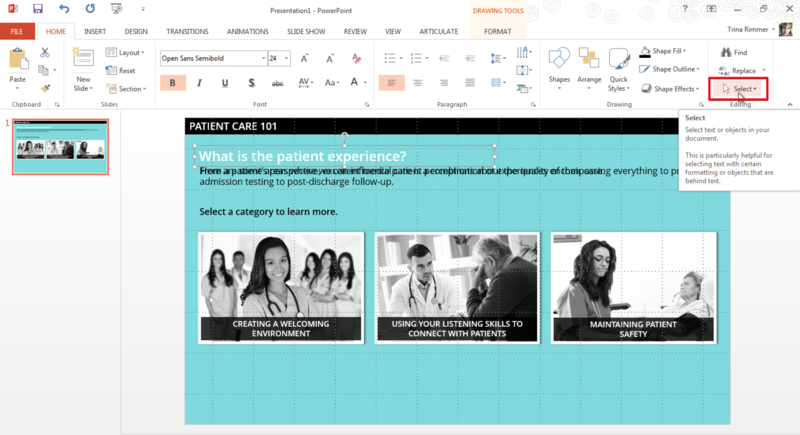 And with these five PowerPoint tips, tricks, and tools, you’re sure to reach genius levels of course development productivity! A slide master is a special slide that contains objects (such as text, images, or placeholders) that you’d want to appear on each slide in your course. In a nutshell, that means you can create a series of custom master design layouts once, and then simply apply those layouts over and over again throughout your project, rather like using a set of cookie cutters. Brilliant, right? I’ve found that slide masters are one of the single biggest time-savers during course development. I could probably spend the rest of this article breaking them down, but thankfully there are plenty of existing resources I can point you to instead. 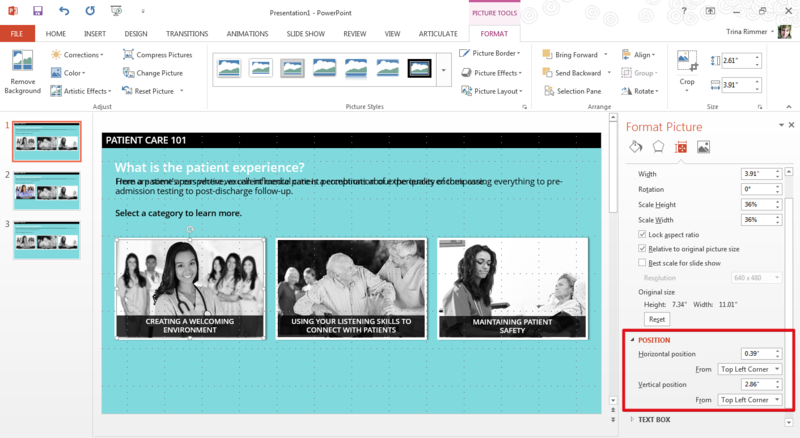 For instance, check out this comprehensive article to learn all about how slide masters work in PowerPoint. And if you’re using Articulate Quizmaker, be sure to check out this article: Time-Saving Tips for Working with Slide Masters in Quizmaker. Speaking of brilliant ideas, whoever invented the format painter should be awarded a Nobel prize! 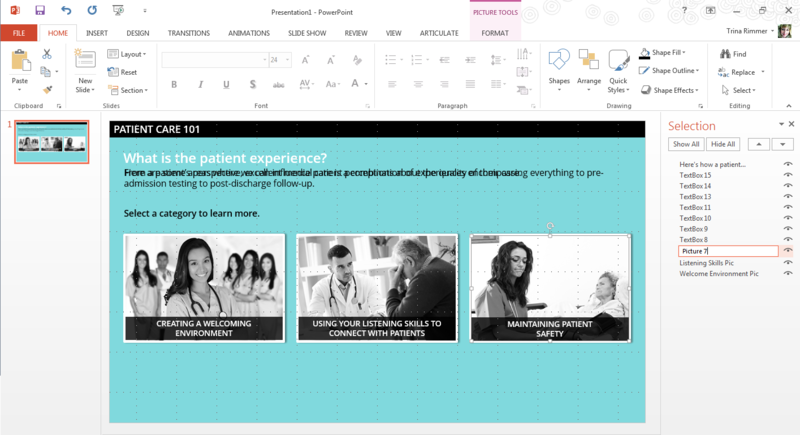 The format painter is one of the most awesome—but also sadly overlooked—features in PowerPoint. Once you get on board with using it, you’ll wonder how you ever lived without it. The format painter gives you a totally painless way to quickly apply a custom design across multiple objects. I like to think of it as another way of copying and pasting—only for formatting instead of content. For example, imagine you’ve got a screen with three images. You’ve invested more than a few minutes in editing one of those images, perhaps adding a border and a drop shadow, maybe changing it from color to grayscale and darkening it slightly. Manually applying all of those same formatting characteristics to the other two images is going to be a little tedious, isn’t it? 1. Select the formatted object you want to copy. 2. Then, click the format painter icon (it looks like a little paintbrush). A single click lets you copy your formatting to one object, but a double click lets you copy formatting to multiple objects. 3. Once the format painter is loaded up with the formatting characteristics you want to apply to your other objects, your pointer will change to a paintbrush. That means, just like when you’re standing in your DIY workclothes, wielding a loaded paintbrush, you’re ready to start “painting” that formatting. Simply click the objects you want to apply that formatting to. Voila! Format painter achievement unlocked! When you’re using a lot of animation in your Articulate Studio courses, sometimes it can get tricky managing all of the objects on your slide. For instance, let’s say you need to change some onscreen text, but the exact textbox you need to edit is one of several, positioned one on top of the next. How do you grab just that textbox without messing up the formatting of all the textboxes positioned around it? Here’s a slide to demonstrate what I mean. Notice the overlapping textboxes? 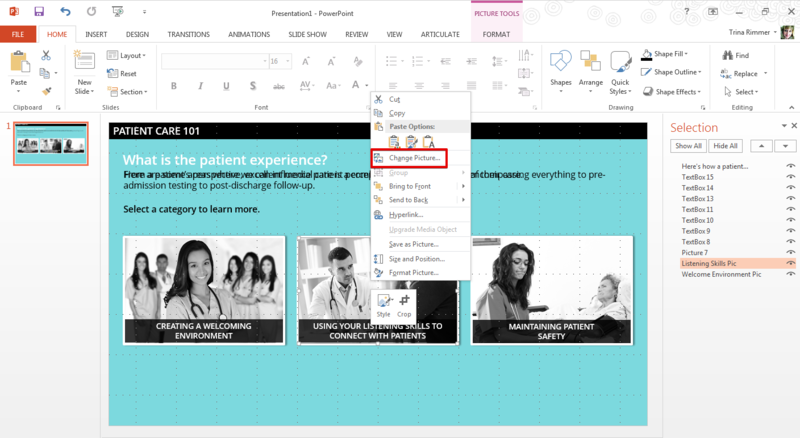 PowerPoint’s selection pane comes in handy for this task—and so many others. Not only does the selection pane allow you to select just the textbox you need to edit (without messing up the placement of other objects), it also lets you hide objects you’re not working on to help declutter your screen—AND it lets you rename objects, which comes in particularly handy for applying animations. Not familiar with the selection pane? That’s probably because it’s tucked away in the editing options on the home tab in PowerPoint. To access it, simply click the dropdown menu and choose Selection Pane. 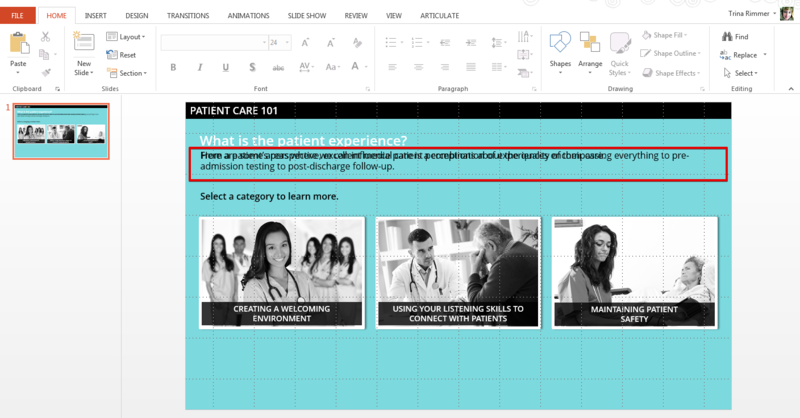 This action reveals the Selection Pane with a list of each object on your slide. From there you can select slide objects, rename them, hide them, and move them forward or backward. To see the selection pane in action, check out this quick how-to video from Tom Kuhlmann. When you’re building courses in Studio, sometimes you need objects placed in very specific spots on your slide to mimic the effect of “selecting” a menu option or clicking a button. Sure you can just drag objects like shapes or images to arrange them on your slide, but what if you’re trying to position objects with more precision? You’ll probably get tired of trying to eyeball it. Thankfully, there are a few better ways. 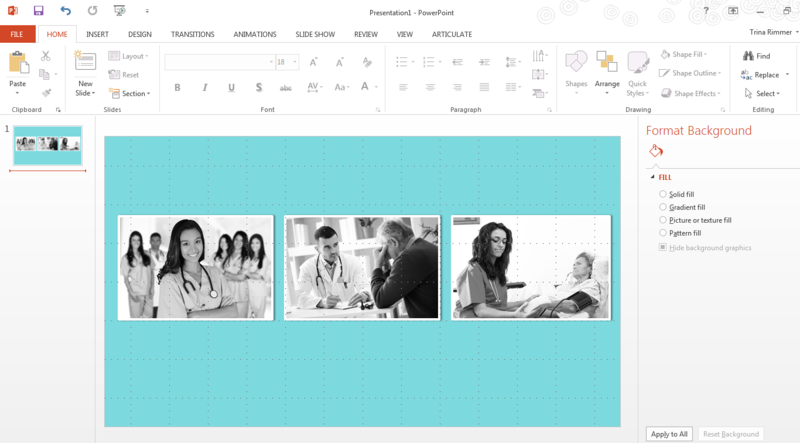 PowerPoint has both tools and tricks you can use to achieve image alignment perfection. 2. From there you can choose if you want to align your selections to the left, center, right, top, middle, or bottom. You can also choose to distribute them evenly, either horizontally or vertically. 1. 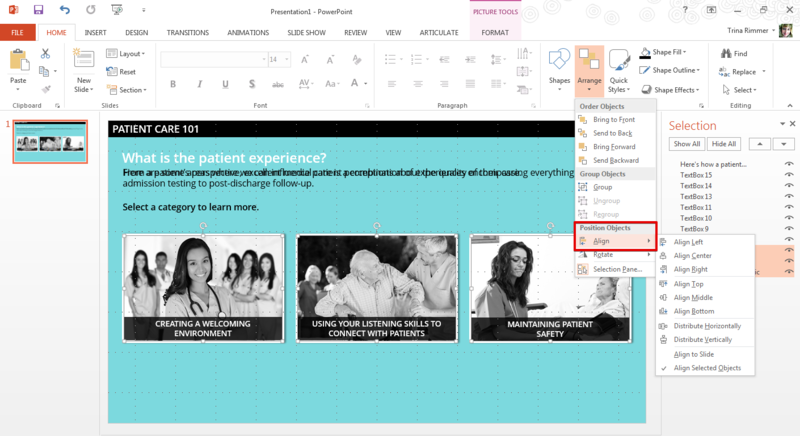 Select the first object and click on PowerPoint’s format tab, or right-click. Choose Size and Position and make note of the vertical and horizontal coordinates. 2. Then, select the next object and click the format tab. Choose the Size and Position option just as you did in step 1, only this time you’ll enter the coordinates for the first object into the vertical and horizontal position fields. 3. Repeat step 2 with any other objects you wish to position. Pro Tip: Once you’ve got an object perfectly placed on one slide, another way to save yourself some time is to copy and paste it from one slide to another. 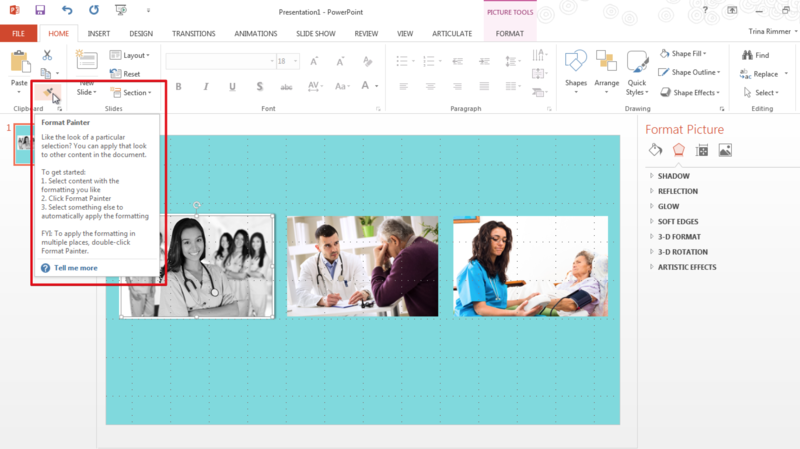 PowerPoint will place the pasted object in the exact same position as the original, but on the new slide. 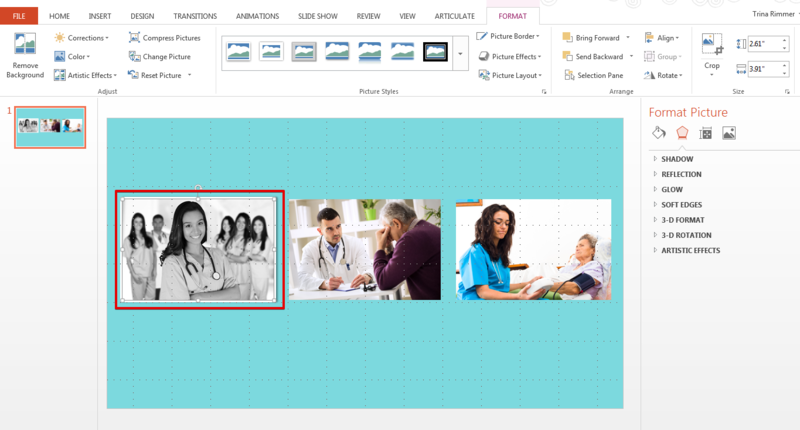 Here’s a familiar situation: you’ve sent your course out for review and your Subject Matter Expert wants a different image on one of the slides. This simple image request seems like a 10-second fix, but in reality swapping an image can end up being a remarkably time-consuming task—especially if you’ve invested a lot of time in rescaling, formatting, and linking that original image to another slide. Wouldn’t it be nice to preserve all of that fine-tuning and just replace the old picture with the new one? 1. With the image you need to replace selected, just right-click your mouse. 2. From the resulting pop-up menu, select Change Picture and then browse to locate the new image file. There you go. Smart image swapping for the win! 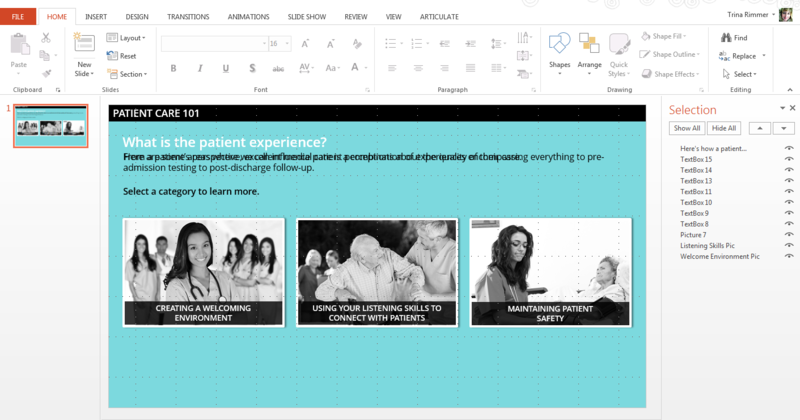 E-Learning Heroes is filled with Articulate Studio and PowerPoint tips and tricks from your fellow pros. Don’t be shy! Dig in and build your skills with these great resources. Have any genius-level tips and tricks to share? Spill the beans and connect with us by leaving a comment below. Want to try out these time-saving tips, but you don’t have Articulate software? Go ahead and download a free 30-day trial. Remember to come back to E-Learning Heroes regularly, and follow us on Twitter to stay up to date on the latest e-learning tips and tricks. Great tips, thanks! Another good PowerPoint trick is the F4 key, which repeats your previous action. For example, if you insert a shape and hit F4, PPT inserts another identical shape. Caveat: it works with most actions, but not all - for example, Grouping and Ungrouping. That's a nice one, Jeri! Thanks for sharing that tip. That Select Pane trick is awesome!!! That'll save me a sh... er, truck-load of time. Thanks. Great tip, Trina! We would also like to add these PowerPoint hacks to improve your deck: http://www.slidegenius.com/blog/3-powerpoint-hacks-improve-your-deck/ Visit http://www.slidegenius.com/blog for more practical presentation tips and advice to improve your public speaking skills.